This College is accredited by NAAC A (National Assessment and Accreditation Council) validity is 18 Jan 2021 and the score is 3.59 . Posted on 05 Feb' 17 by S.k. College Infrastructure- 4 start. I have not given 5 star only because NLU Delhi dont have any playgrounds. Students play football on basketball court. There is a separate volleyball and badminton court. Auditorium and Moot Court hall here are luxurious. Campus is small as compared to other law schools, but then again it has Urban locality and it is in capital of India. World class library facility, special Moot court research room. College Placement- 5 star. All big law firms visit the campus and multinational law firm like Linklaters take placements only from NLU Delhi in India. All good students are placed in P.P.O itself. Average placement would be around 12-14 Lahks. Every year at least 4-5 students get admission in Harvard, Cambridge, Oxford college for higher degrees. In 2014-15, 3 students from NLU Delhi cleared UPSC examination. And the Delhi and Haryana Judicial Examination toppers were also from NLU Delhi. Faculty- 4 star. Some faculty for first and second year really lack qualities of the prestigious law school. 3rd year onward university provides renowned faculty to teach at the classrooms.Renowned Faculties of India. College Life- 4 star Lot of academic pressure here. 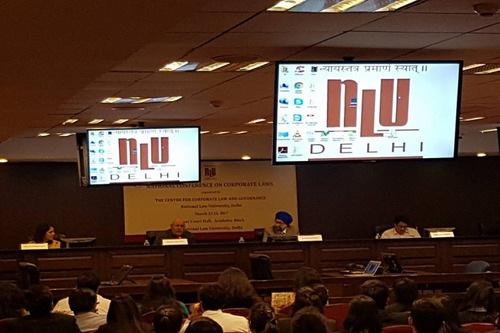 National Law University Delhi (NLU Delhi) has been officially selected by ICC Hague and Leiden University for organizing the 2016 India Qualifying National Rounds of the International Criminal Court Moot Court Competition. HSF International negotiation competition is organised in India only at NLU Delhi. College will also organize Price Media Moot 2015 South Asian Rounds. So you get lot of experience here as some world famous events are organised here. Hostel- 3 star. Separate hostels for boys and girls. Here students get 3 seater rooms for first 3 years. And for last 2 years they get 2 seater with attached balcony. Mess food is really good as compared to other colleges. Common room has TT table and a pool board along with a Television. Gym facility available here. 2 lifts installed in the building Provision for Hot water in bathrooms. 2 Water cooler along with R.O. Facility on each floor. 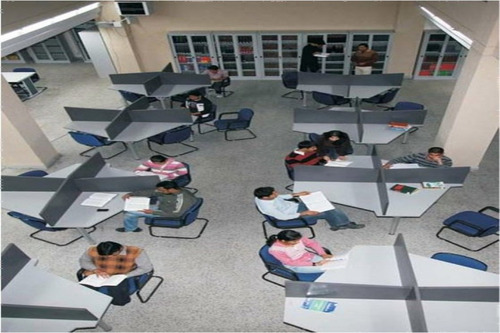 Students get a separate study table, chair. The college has an excellent infrastructure. The library is abundant with latest books, canteen has a café coffee day kiosk, auditorium feels like a movie theatre, underground parking is available (though not for students), and is a well-kept campus. The internet speed is adored by everyone. Most of the faculty is good considering they rejected job offers from some highly reputed law firms. Teaching methodology of some professors is unique and appealing. The university is surrounded by lush trees which add to the ambiance. Hostels are compulsory even for the students residing in the same city, which I feel provides necessary exposure. The auditorium is comparable to a mediocre movie theater. Lots of seminars are organised on varying contemporary legal topics. Sometimes associates from leading firms are invited for providing insight into the field and answering students' questions. Weekly movie screenings, occasional parties, internal sports tournaments, etc keep me engaged. We have been provided with vending machines in the hostels which are complimented by excellent mess food, common room, and gym. Geographical and cultural diversity among students is what mesmerised me the most on my first day in the college. The only thing I despise about the university is the lack of sporting facilities. There is only one ground where students have to compromise with basketball, volleyball, and football. Badminton courts are uncovered. Another minor problem is that since LLM students stay for less time as compared to others, they are not given much importance in various committees which are elected like sports, mess, hostel welfare, academic, etc. Considering it is a government-run university, it has an excellent infrastructure. The internet speed is adored by everyone. Most of the faculty is good considering they rejected job offers from some highly reputed law firms. Teaching methodology of some professors is unique and appealing. The university is surrounded by lush trees which add to the ambiance. Hostels are compulsory even for the students residing in the same city, which I feel provides necessary exposure. The auditorium is comparable to a mediocre movie theater. Lots of seminars are organised on varying contemporary legal topics. Sometimes associates from leading firms are invited for providing insight into the field and answering students' questions. Weekly movie screenings, occasional parties, internal sports tournaments, etc keep me engaged. We have been provided with vending machines in the hostels which are complimented by excellent mess food, common room and gym. Geographical and cultural diversity among students is what mesmerised me the most on my first day in the college. The only thing I despise about the university is the lack of sporting facilities. There is only one ground where students have to compromise with basketball, volleyball, and football. Badminton courts are uncovered. Its a dream college of every law students. College Infrastructure- 4 start. 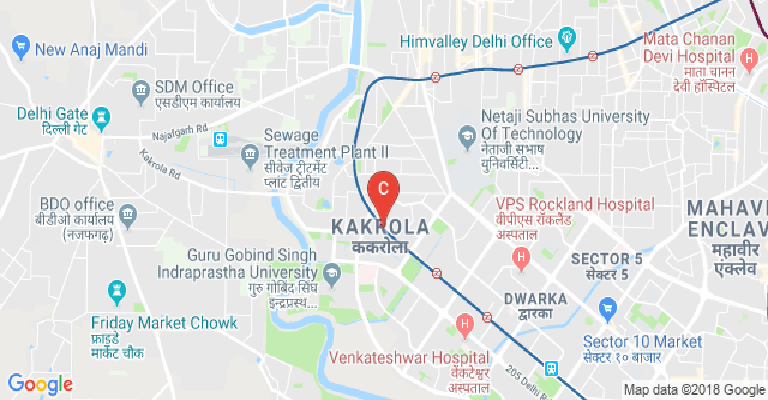 I have not given 5 star only because NLU Delhi dont have any playgrounds. Students play football on basketball court. There is a separate volleyball and badminton court. Auditorium and Moot Court hall here are luxurious. Campus is small as compared to other law schools, but then again it has Urban locality and it is in capital of India. World class library facility, special Moot court research room. College Placement- 5 star. All big law firms visit the campus and multinational law firm like Linklaters take placements only from NLU Delhi in India. All good students are placed in P.P.O itself. Average placement would be around 12-14 Lahks. Every year at least 4-5 students get admission in Harvard, Cambridge, Oxford college for higher degrees. In 2014-15, 3 students from NLU Delhi cleared UPSC examination. And the Delhi and Haryana Judicial Examination toppers were also from NLU Delhi. Faculty- 4 star. Some faculty for first and second year really lack qualities of the prestigious law school. 3rd year onward university provides renowned faculty to teach at the classrooms.Renowned Faculties of India like Upendra Baxi, B.B.Pandey, M.P.Singh, Ranbir Singh, sachidanandam, Jaigovind, Bajpai take regular classes. College Life- 4 star Lot of academic pressure here. National Law University Delhi (NLU Delhi) has been officially selected by ICC Hague and Leiden University for organizing the 2016 India Qualifying National Rounds of the International Criminal Court Moot Court Competition. HSF International negotiation competition is organised in India only at NLU Delhi. College will also organize Price Media Moot 2015 South Asian Rounds. So you get lot of experience here as some world famous events are organised here. Hostel- 3 star. Separate hostels for boys and girls. Here students get 3 seater rooms for first 3 years. And for last 2 years they get 2 seater with attached balcony. Mess food is really good as compared to other colleges. 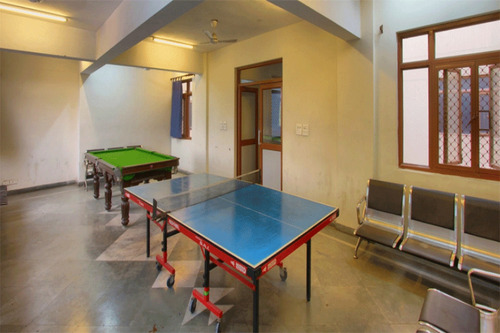 Common room has TT table and a pool board along with a Television. Gym facility available here. 2 lifts installed in the building Provision for Hot water in bathrooms. 2 Water cooler along with R.O. Facility on each floor. Students get a separate study table, chair. 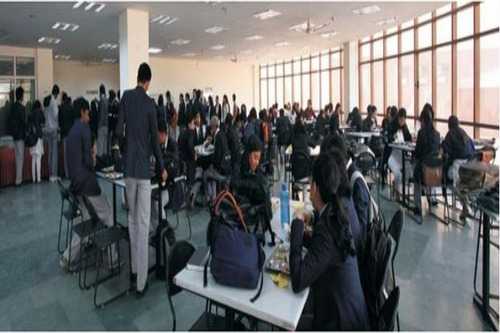 NLU is a big brand with whom many students want to get associated with.it has a vast and sprawling campus with well maintained infrastructure.faculty is filled with knowledge and feels great that you are being taught by such nice and helpful teachers. Does NLU's taking admissions through CLAT provide B.com LLB also or just BA LLB? Is clat is necessary for admission in nlu after graduation?? What is the method for admission in nlu after graduation which type of interence ??? After you get your marks of the exam (CLAT). Do the NLU'S take you after the PI'S and GD? Or The merit list and ranking decides? I started my preparation for clat only 3 days ago.. I determined to achieve seat in nlu this year.... I am weak in current affairs,english. The National Law University Delhi (NLUD) was established in the year 2008. The Chief Justice of the Delhi High Court functions as the ex officio Chancellor of the NLUD. This Delhi- based institute is also one of the few NLUs to stay away from the CLAT exam. Instead, it recruits students using the AILET (All India Law Entrance Test). This is a test for a single institute only NLU- Delhi. Unlike CLAT, this is for 150 marks only, but the time limit is that of a football match – 90 minutes. While Maths is for only 10 marks, the other four usual segments are worth 35 marks each. AILET used to be one which did not have negative marking, but that has been reversed now. Courses are available at the NLUD at both the UG as well as PG levels. At the UG level, the flagship five- year integrated programme BA LLB is offered. The LLB of course is the standard degree offered to Common Law countries’ legal study graduates. At the master’s level, the LLM is offered here. There are seven optional specialization areas for one to pursue an LLM. Several optional seminar courses are also on offer here. 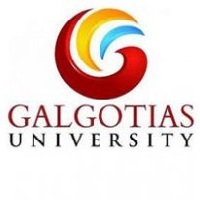 This includes for topics such as European Law, Comparative Law, Contract Drafting, Advanced Criminal Procedure, Copyright X, Corporate Taxation, Criminal Practice, Corporate Finance, Corporate Litigation, Indirect Taxation, Indian Trademark Law, International Investment Law, International Economic Laws, Media Laws and Legal Drafting among several others. Bridge programmes are also available for those who want to complete their education, or those to have studied from foreign countries, where certain courses require some brush- up. This also includes some compulsory papers such as Property Law, Constitution of India and Professional Ethics. PG diplomas may be taken up in certain areas where working professionals seek to build greater level of expertise. At present the areas of such training are in – Urban Environment Management & Law, Environmental Law & Policy and in Tourism & Environmental Laws. All these diplomas are run in collaboration with the Worldwide Wildlife Fund (WWF). The institute is also a leader when it comes to legal research. For this purpose, specific centres of excellence have been created to facilitate the same. There are centres here for the areas of – Comparative Law, Communication Governance, Death Penalty, Transnational Commercial Law, Social Inclusion & Minority Rights, Transparency & Accountability in Governance, Comparative Studies in Personal Laws, Banking & Financial Laws, Corporate Law & Governance and for Criminology & Victimology. There is a Centre for Environmental Law, Policy and Research (CELPR). Another is the Centre for Innovation, Intellectual Property and Competition (CIIPC). And another one is the Centre for Constitutional Law, Policy and Governance. Besides this, the NLUD includes two endowed chairs. These are the K.L. 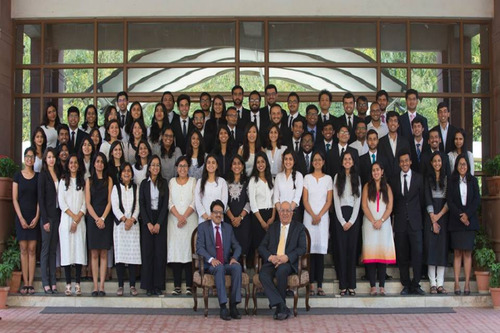 Arora Chair in Criminal Law and the Justice B.R. Sawhny Chair in Professional Ethics. The NLUD is also a trainer when it comes to forging MoUs with academic institutions, research centres or corporate houses to further its research, industry connect and academic credentials. Some of these partners are the fellow NLUS in places such as Kolkata, Bengaluru, Patiala and Tiruchirappalli. Partner agencies include the Amnesty International and the UNHCR (United Nations High Commission for Refugees). Academic collaborators abound from across the world’s continents. Examples from the USA include the likes of – Harvard Law School, University of New Hampshire, Regent University, the Pepperdine University and the Lewis & Clark Law School. European partners come from countries such as the UK, France, Italy, Belgium, the Netherlands and Germany. 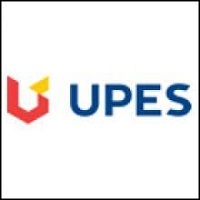 The Deakin University and the University of Melbourne are the collaborators in Australia while from South Africa, there is the University of Johannesburg. All this focus on research and academics has led to the NLUD featuring highly across ranking platforms. It has been placed as the 2nd best law college in the NIRF (National Institutional Rankings Framework) with a AAAA+ rating point. All this has in turn fueled excellent placements on campus. Some of the key recruiters in recent seasons have been the likes of- Bajaj Finance, AZB & Partners, CPA Global, ICICI Bank, Tata Power, Uber, Lex Counsel, PDS Legal, Themis Associates, Herbert Smith Freehills, Tri Legal, CCG, Star India, Wipro, Udwadia, Verus Legal, S&B Partners and S&R associates among others. 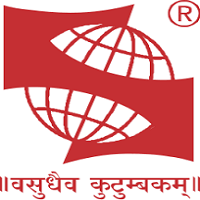 This College is accredited by NAAC (National Assessment and Accreditation Council) A validity is 18 Jan 2021 and the score is 3.59 . Boys Hostel :The University has a sprawling campus at Dwarka with state of art infrastructure facilities comprising of an academic block (five floors), separate halls of residence (six floors), an independent administration block (five floors), a fully air-conditioned auditorium for holding conferences and seminars. The University is fully residential and maintains separate residence for boys and girls. The Halls of Residence are provided with common room facilities, indoor games, like TT, Pool Table, Television and a State of Art Gymnasium. Management and maintenance of discipline in the halls of residence is the responsibility of the residents, Chief-Warden, Wardens and Assistant Warden. The residents have to mandatorily conform to the rules and regulations of the University. 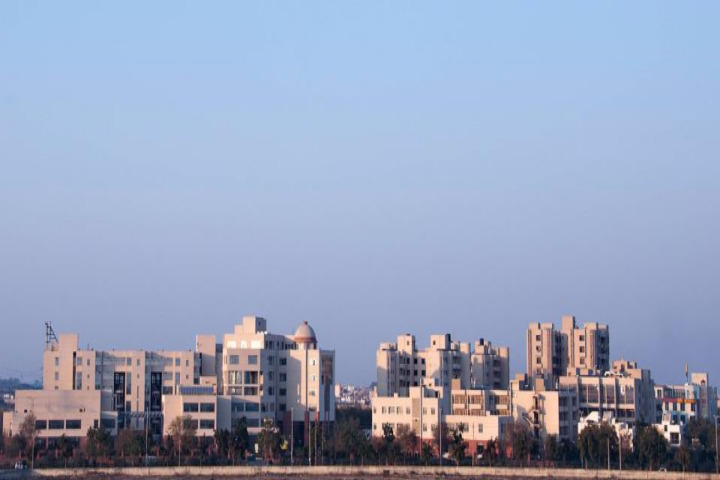 Girls Hostel :The University has a sprawling campus at Dwarka with state of art infrastructure facilities comprising of an academic block (five floors), separate halls of residence (six floors), an independent administration block (five floors), a fully air-conditioned auditorium for holding conferences and seminars. The University is fully residential and maintains separate residence for boys and girls. The Halls of Residence are provided with common room facilities, indoor games, like TT, Pool Table, Television and a State of Art Gymnasium. Management and maintenance of discipline in the halls of residence is the responsibility of the residents, Chief-Warden, Wardens and Assistant Warden. The residents have to mandatorily conform to the rules and regulations of the University. Medical/Hospital :The university has a 24 hours medical room with a nurse. A doctor visits the campus from 4-6 p.m every day. 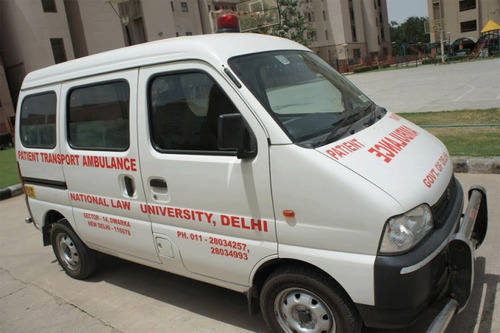 An ambulance is also available round the clock for the residents of the University to deal with any emergency situation. 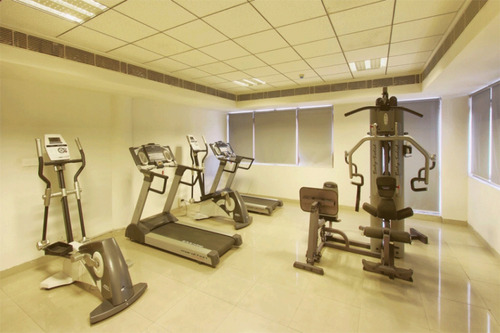 Gym :State of art gymnasium with the latest equipment for boys and girls in their respective halls of residence. Library :National Law University Delhi Library also is known as Justice T. P. S. Chawla Library was inaugurated by Hon'ble Justice Mr Deepak Misra, the Chief Justice of Delhi High Court in 2010. The library has been named after Justice T.P.S. 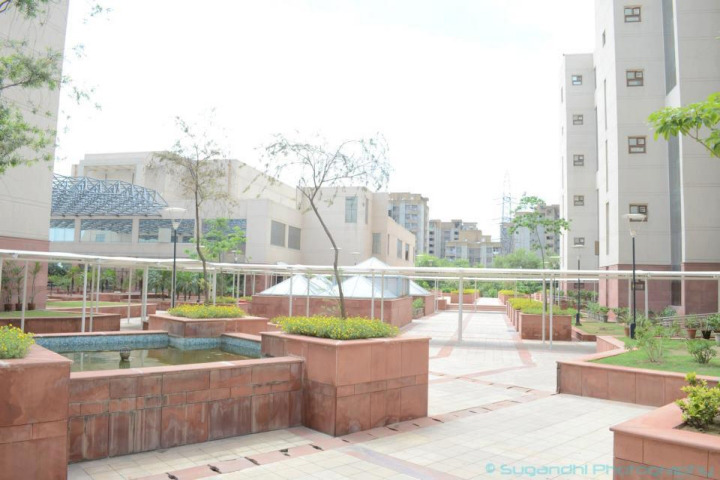 Chawla has a separate building with two floors with the beautiful campus of the University. The mission of Justice Library emphasizes mainly to cater to the needs of students, scholars and teachers of the National Law University, Delhi. It is also open for reference to Library Interns, research scholars and faculty members of other educational and research institutions. The Library acquires, catalogues, preserves and makes available a world-class collection of both contemporary and historical legal materials. Presently library has a sound collection of over 37500 books and bound volumes of Journals and 180 current subscriptions to journals and newspapers along with 250 CDs and DVDs. Currently Library is subscribing a number of online databases of international and national spheres i.e. Westlaw International, LexisNexis Academic, Hein Online, JSTOR, Kluwer Arbitration Online, E-Hart Books, Manupatra, SCC Online, Taxmann, Corporate Law Advisor Plus, India Stat and AIR InfoTech Supreme Court of India, High Courts and Criminal Law Journal. In this year, the Library has added around 1210 books and 322 bound volumes journals. A library has also enhanced its digital collection of 472 E-Books from Oxford University Press and 464 E-Books from Cambridge University Press. Other than print and digital collection, Library maintains an article indexing system. Till date, more than 13500 academic articles published in various international and national journals subscribed by the Library in print format have been indexed as ready reference research service. The bibliographical details of articles are easily accessible on the basis of author, title, subject, keywords and free text search. The Library performs a number of anticipatory and response based services to its clientele. Library sends regular updates of Supreme Court of India Judgments, Central Legislation, Newspaper Clipping Articles, Article Alerts and Book Alerts through emails to students and faculty members. Library also responds over the electronic request received from faculty members and students over a specific subject area of interest. Sports :The facilities for sports are planned in the additional land which will be available to the University for the purpose, shortly. At present, the university has a basketball, volleyball courts and state of art gymnasium with the latest equipment for boys and girls in their respective halls of residence. I.T Infrastructure :The campus is wi-fi (wireless friendly) enabled. The internet centre is located in the Library and has 50 high-end desktops with Microsoft operating system and well equipped with optical drives. Besides this, a separate bay is also provided for laptop users. The internet centre is supported with three servers and with a high-speed bandwidth, centrally document & print facility is also available. To meet the growing challenges of internet usage & e-learning, the centre supports students for research & e-learning. The Internet Centre also works closely with leading academic stakeholders, providing on-line databases like Manupatra, Lexis Nexis, and Westlaw etc. 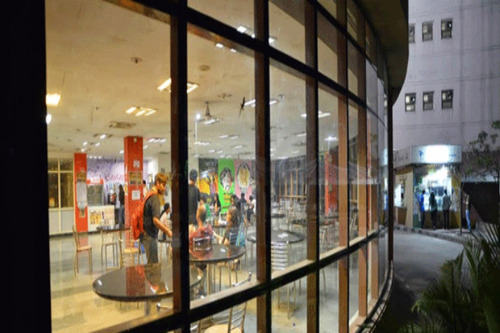 Cafeteria :University has a well-furnished Cafeteria and a well equipped separate mess in the Boys and Girls Hostels. 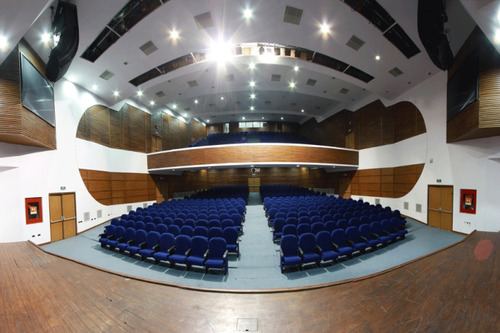 Auditorium :The University has a fully air-conditioned auditorium with a sitting capacity of over 650 people. The auditorium is equipped with the latest state-of-the-art audio and visual facilities. The auditorium is used for organizing University functions including seminars, conferences and cultural programs. 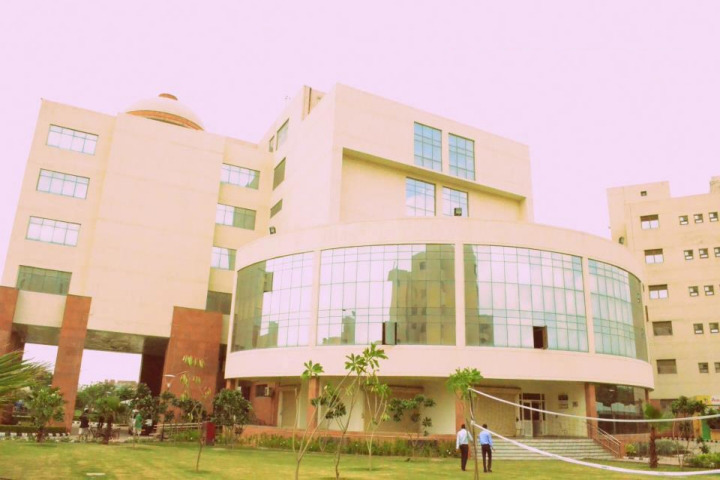 NLU-Delhi has four Conference/Seminar rooms furnished with state-of-the-art facilities in the Academic Block. 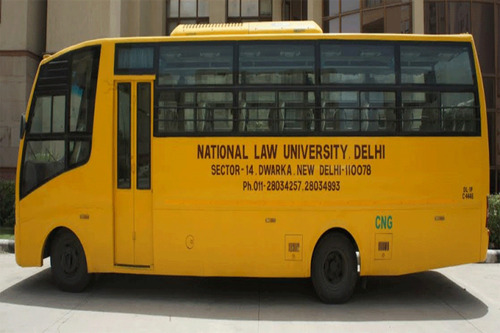 Transport Facility :The University also has two Innova Cars and a bus which is used for the student's activities such as court visits, Legal Aid Programmes and Clinics. The University is very well connected through Metro Rail and has good DTC bus services. Wifi :The campus is wi-fi (wireless friendly) enabled. The internet centre is located in the Library and has 50 high-end desktops with Microsoft operating system and well equipped with optical drives. Besides this, a separate bay is also provided for laptop users. The internet centre is supported with three servers and with a high-speed bandwidth, centrally document & print facility is also available. To meet the growing challenges of internet usage & e-learning, the centre supports students for research & e-learning. The Internet Centre also works closely with leading academic stakeholders, providing on-line databases like Manupatra, Lexis Nexis, and Westlaw etc. Classrooms :Classrooms are well equipped with digital podiums, LCD projector & display screen and internet (wi-fi) access. The students are required to purchase Laptops for making best use of internet connectivity for research purpose. All the classrooms have e-Station Smart Multimedia Podium for teaching. The e-Station is equipped with the facilities of touch screen, writing, sound system, visualizer, CD player and recording etc. 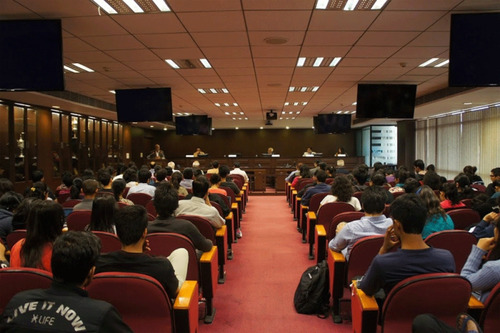 Moot Court :The University has state-of-the-art E-Moot Court Hall equipped with hi-tech audio visual equipments having a seating capacity of 170 people.